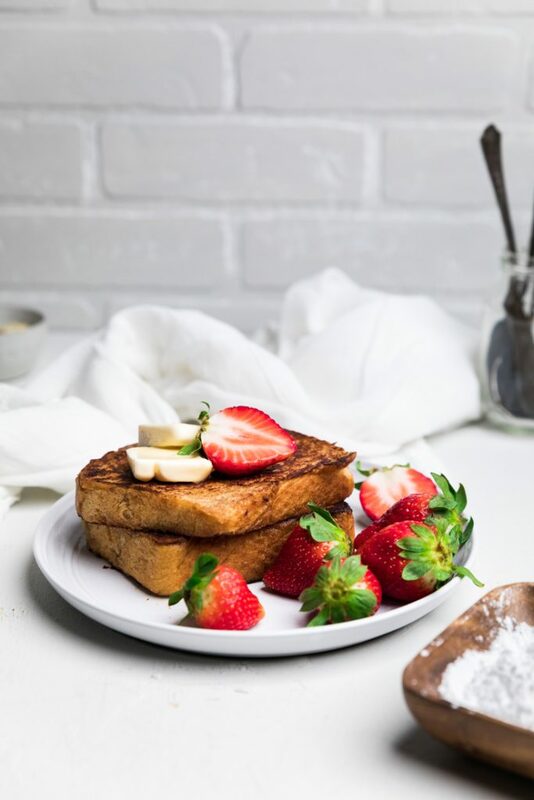 This dairy free french toast recipe is the most delicious dairy free breakfast around. A huge hit for the whole family, soft and fluffy! A great dairy free brunch idea. It’s a completely vegan french toast recipe! We all know comfort foods. Hearty soups, yummy mac and cheese, a delicious slice of pizza. 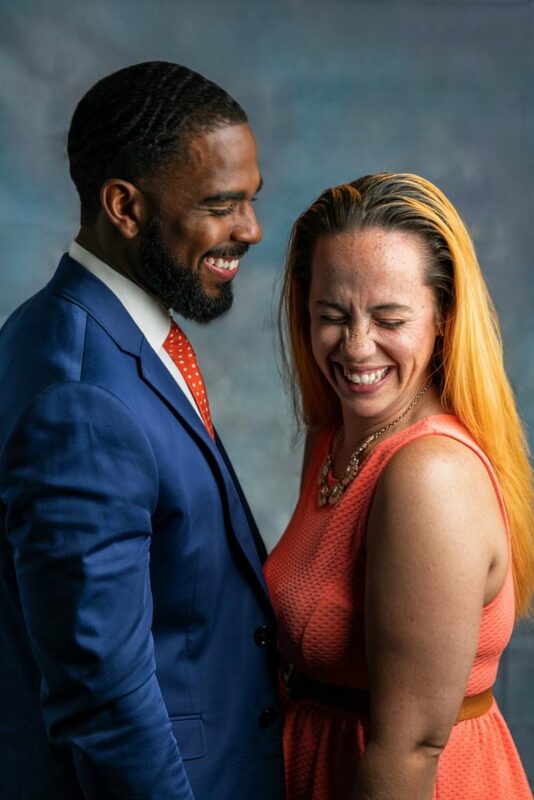 It’s different for everyone. Comfort breakfasts are no exception to food that can make us feel all warm and fuzzy inside. One of the most comforting breakfast meals is french toast. However, french toast is usually make with milk and eggs. 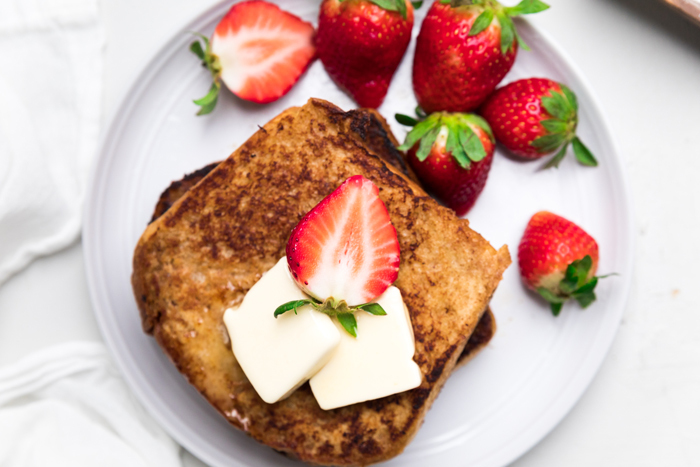 If you have food allergies or preferences though, you may think french toast is off the table. No more! This dairy free french toast recipe (that’s all completely vegan) will rock your world. 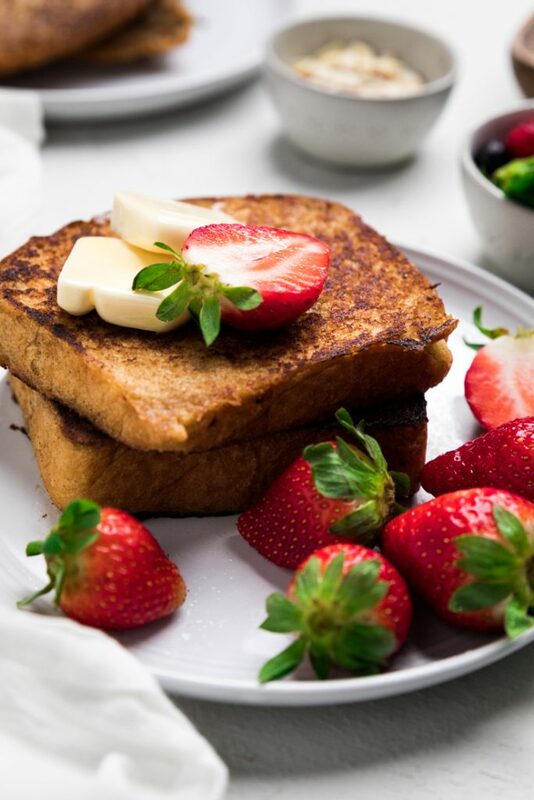 This dairy free french toast recipe is a special family recipe around here. Almost every Friday night, we make a delicious loaf of dairy free bread. 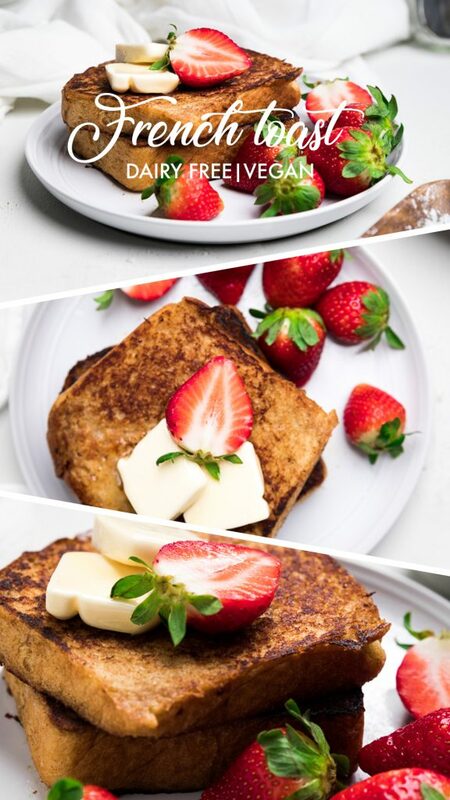 Then, Saturday mornings, we turn it into this amazing dairy free french toast recipe that everyone devours within minutes. It’s a small price to pay for a memory that lasts a lifetime. 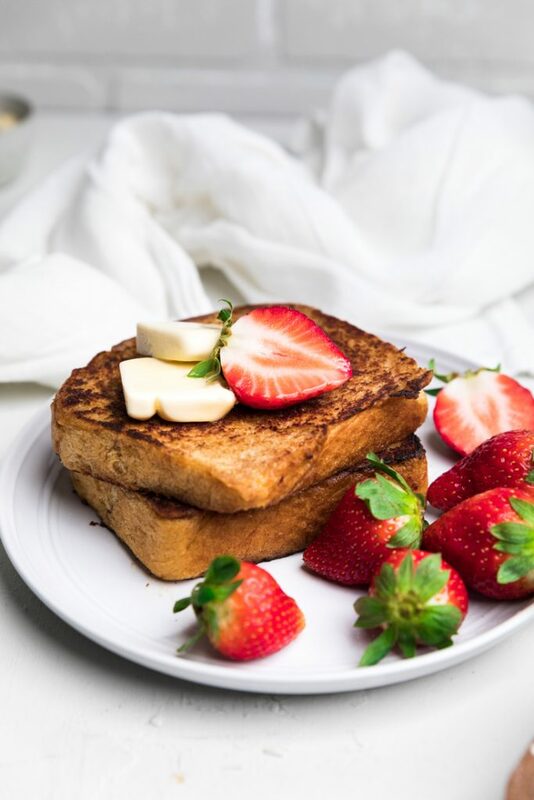 What ingredients do you need to make this dairy free french toast? Those are all you need for this delicious vegan breakfast idea! 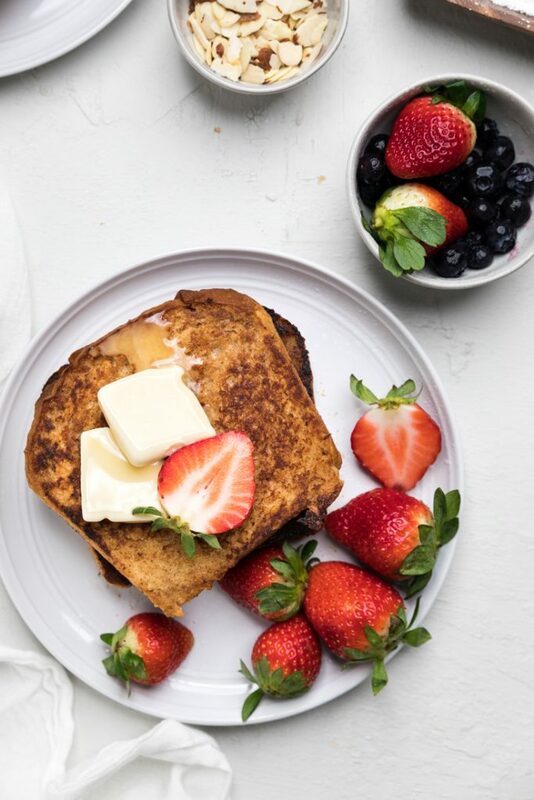 How do you make this dairy free french toast? Making dairy free french toast is actually very easy to do. If you are making homemade bread, then you’ll want to start by making that. Otherwise, you just need your favorite dairy free bread. Blend or whisk together all the ingredients in a large, flat container. You want a flat container versus a bowl because it’s easier to make dairy free french toast when you can lay the bread flat to soak up the mixture. After you’ve blended the ingredients together, let the mixture sit for 15-20 minutes. In a skillet, melt some dairy free butter or coconut oil over medium heat. Dip a slice of bread in the dairy free french toast mixture. Cook for 2-3 minutes or under golden brown, then flip and cook under golden brown on other side. Top with any favorite toppings or just some delicious syrup! 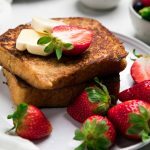 What are topping ideas for dairy free french toast? Blend or whisk together all the ingredients except bread in a large, flat container. In a skillet over medium heat, melt some dairy free butter or coconut oil over medium heat. Dip a slice of bread in the dairy free french toast mixture. Cook for 2-3 minutes or under golden brown, then flip and cook under golden brown on other side. Top with any favorite toppings or just some delicious syrup! See post for topping ideas. **Nutritional facts are just estimates. Please utilize your own brand nutritional values to double check against our estimates. Nutrition facts DO NOT include bread as it would depend on if you make our recommended homemade bread recipe or if you utilize your own.